Upon entering this majestic property you will quickly forget you are in SW Virginia as the European design, architecture and decor will fully consume you. Every detail of this farm has had meticulous thought put into it. The main house, built in 1940 was stripped completely, added onto & built completely new in 2011. It has 3-4 beds, 3.5 baths, heated floors, central air & heat, jacuzzi tub, Cathedral ceiling and so much more. Outside stone steps lead to a Pub w/ a arbor deck overlooking one of the pristine pastures & spectacular mountain views. A brick walkway bordered with beautiful landscaping leads you from the main house to the guest house. The guest house was just completed this year and has its own septic system. The guest house features a large gathering room w/ wet bar, 2 beds, kitchenette, stone slab shower w/ heated floor, heat & AC and fountain. There are fenced pastures, barn, outbuildings, 3 ponds... Please ask your agent for full feature list and 3D Tour link. The driveway uses French drainage and culverts using river rock that naturally diverts the water. There are 3 fenced pastures which cover roughly 8 acres. There are 3 ponds all of which are fed by at least two constantly flowing springs. The twin ponds are on the North side of the house and are stocked; one with Bass and one with Trout. On the other side of the property is the Catfish and Perch pond which features an island. There are over 6 miles of trails wrapping in and around the property that are perfect for ATVs, mountain biking and hiking. Between the two houses are a workshop, outbuilding, two bay garage and tractor shed all of which have power, lights and 240 AC for power tools. Off the master bedroom is the Courtyard with 4 person hot tub, outdoor shower and seating area. Some features of the main house: Hemlock - Board & Batten Siding, 40 year architectural shingles, Halogen lighting throughout, new septic, 360' deep well w/ 8 gallons per minute. MINI FARM IN QUIET SUBDIVISION: NEAR SHOPPING / LOW TAXES! MOVE-IN READY FOR YOU AND YOUR HORSES! 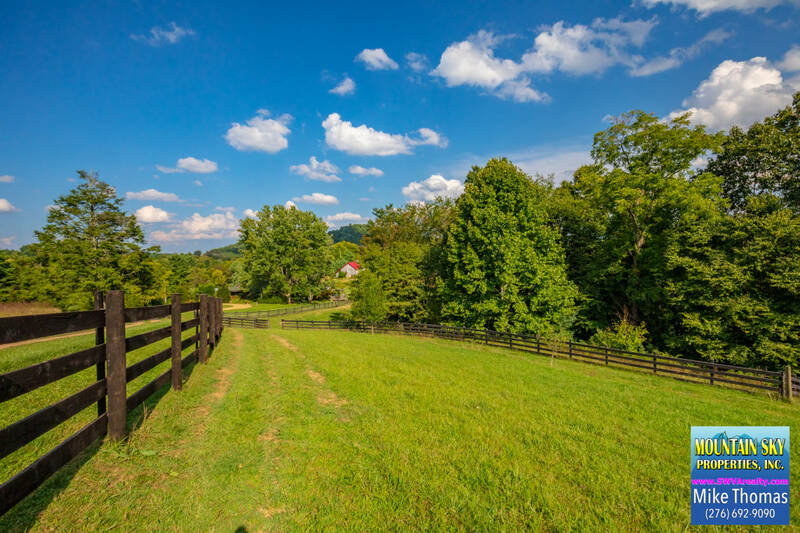 AFFORDABLE GREAT HORSE PROPERTY JUST MILES AWAY FROM LEXINGTON VA HORSE CENTER. SPECTACULAR VIEWS WITH ALMOST 360 DEGREES. MAGNIFICENT PROPERTY. BRING YOUR HORSE TO THE LAKE! BLOWING ROCK, NORTH CAROLINA - HORSE PROPERTY FOR SALE WITH GORGEOUS VIEWS!